A 'Team Shelby' Fundraising Page: WE NEED YOU! HOW YOU CAN HELP! How can you become a part of Shelby's action? 1 - Provide an item to be auctioned! Remember the great GABE event earlier this year? Shelby's auction will work along the same principles, except instead of generous doggies giving great gifts away for free you will auction them via this page for a for a small amount (we thought we would limit all items to a $8.00 maximum). Simply make up a treat bag, e-mail a photo of the item(s) and description(s) to us (via our pee-mail address on the right hand navigation bar) by 21st August latest ready for the live auction on the weekend of 28th/29th August. Please send information about items to be auctioned as soon as you are able to allow everyone enough time to browse at what is available!! We have started posting our auction items below so please look for inspiration! We're going to add to the items we'll be auctioning over the next few days/weeks - we'll be including human treat packs as well as doggie treat packs so you can bribe - erm, we mean spoil! - that 'special someone'! PLEASE NOTE!! After feedback received please note that treat packages we are providing cost more than the auction cover price - all items are new but they're things that our hoarder of an FH (female human) has accumulated over several months so we've decided enough is enough, we need to free up some space in our house, he he he! So those bidding will be getting a bargain whilst also helping a worthy cause. We view this auction rather like a 'bring and buy sale'!! PLEASE NOTE AGAIN!! After further feedback received we are now thinking of adding a 'de-luxe' section for treat packages that VERY special and will command a higher price than $8.00! So, if you are providing something EXTRA special please DO feel free to add a higher bidding price! We had initially wanted to keep the costs low so that lots of people could contribute during these lean times without breaking the bank, but we realise that some pups will want to purchase early for Christmas so we're going to take the opportunity to widen the auction a little!! 2 - Bid on an item!! 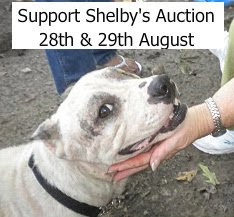 We're hoping that by 28th/29th August Shelby's auction will include a wide range of items so there'll be something for everyone! Why not surprise someone and order them a treat pack? Why not do some early Christmas shopping and bid on a few items to store away? We will be requesting that all items are paid for at the auction via PayPal so that the money can go directly into Shelby's account and we will publish bidding instructions nearer the actual auction. 3 - Advertise Shelby's auction on your blog! Please help us get the word out about Shelby's auction by telling everyone about it on your blog! The more people who know about the auction the more items we'll get to auction; the more items we get to auction the more green papers we'll get for Shelby! Please feel free to publish the button below and link to the auction page. Thanks everyone - let's see what the 'power of the paw' can achieve!